Ó Riada Solicitors – fearlessly for you! Welcome and thank you for visiting our website! Our aim in Ó Riada Solicitors is to provide you with appropriate, reasonably priced, creative and efficiently delivered legal services which will enable you to implement the best solutions for your legal affairs and their related personal and business objectives. We are situated in Liffey House, on Primrose Hill in Celbridge, Co. Kildare. This is approximately 15 minutes driving time from the M50 Motorway and 40 minutes from Dublin. We are a multi-discipline but specialised legal practice with special emphasis on serving the legal requirements of small and medium sized businesses (“SMEs”) and their owners and managers. Unlike other legal firms who differentiate sharply between their client’s business legal affairs and their client’s private/personal legal affairs, we see our client’s legal affairs whether originating in their personal life or their business life, as being at all times personal and important to our clients and therefore meriting equal care and attention from us. © Copyright 2019. 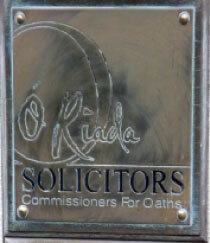 Copyright in the contents of this website is vested in the partners ("the Partners") of Ó Riada Solicitors ("the Firm"). Any use or reproduction of the contents of this site, without the prior written permission of the Partners of the Firm is expressly forbidden.